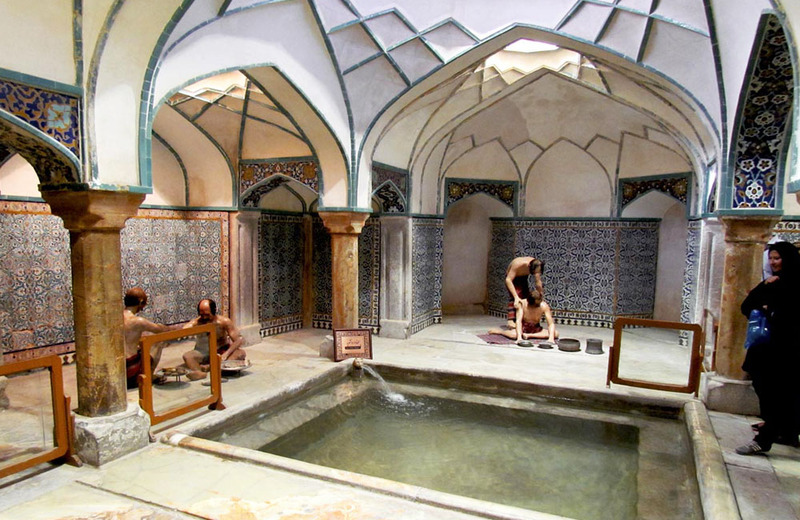 Commemorating the old tradition of the Persian Safavid bathhouses, Hammam-e Ganj Ali Khan, also known as the Ganj Ali Khan Bathhouse, invites travelers and visitors to a peek inside of an age-old tradition. Once inside, it becomes obvious as to why this was Kerman’s most valuable and important hammam (bathhouse). The beautiful building is absolutely covered resilient finely crafted resilient frescos, decorated tiles, arches and domes. It can be seen, somewhat, like an old-aged open-space spa with little places to hangout and socialize while attending to hygiene. 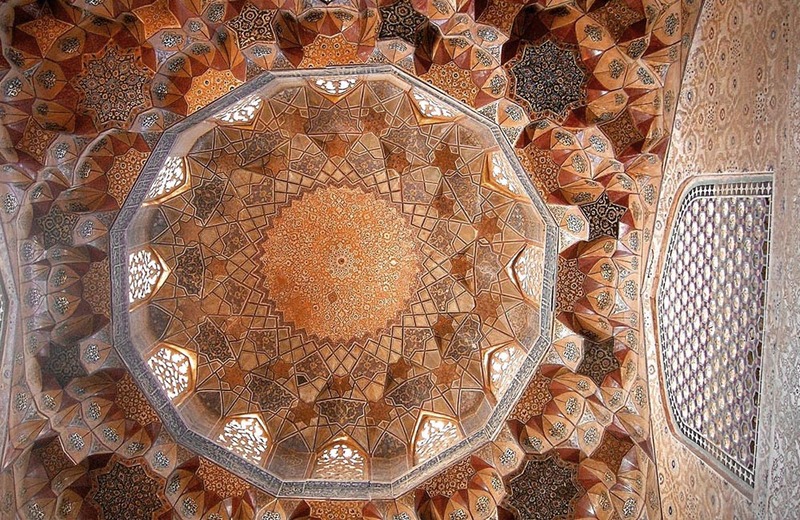 Come along with goingIRAN to learn and discover more about this attraction! The bathhouse’s design has many interesting little features that wait to be discovered by its visitors. For example, the reception area (changing/disrobing area) was designed in such a way to have the men of all different trades change together. Six different divisions separated the farmers, merchants, labourers, governors…etc. 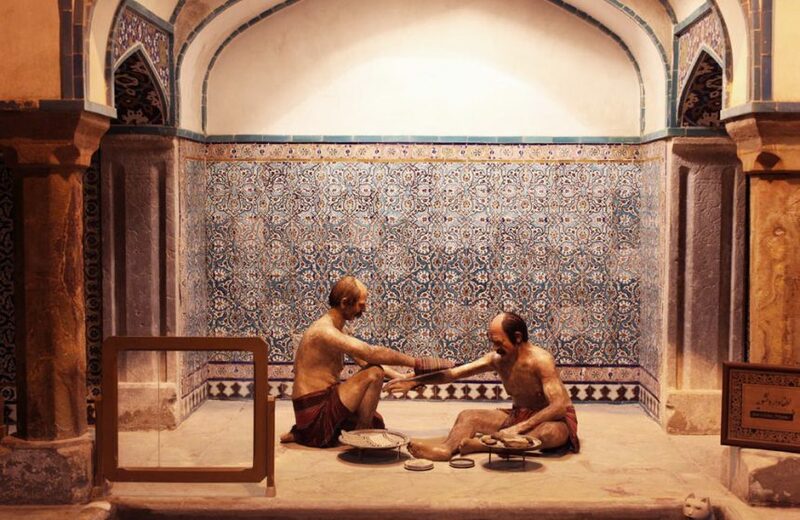 Another very attractive and unique feature of this hammam, now a museum, is the placement of wax figures in the different areas. Dressed in fully traditional attire, just as they would be during the Safavid era, the figures show visitors still-shots of scenes they would’ve only seen four hundred years ago! Now, not wanting to give too much of this old gem’s beautiful secrets away; we only suggest that you consider at least a couple of hours for visiting here. Just the intricate artwork that covers the whole interior will keep yours busy for well over an hour! Located around the Ganj Ali Khan Square, the area is sometimes also referred to as Ganj Ali Khan Complex. 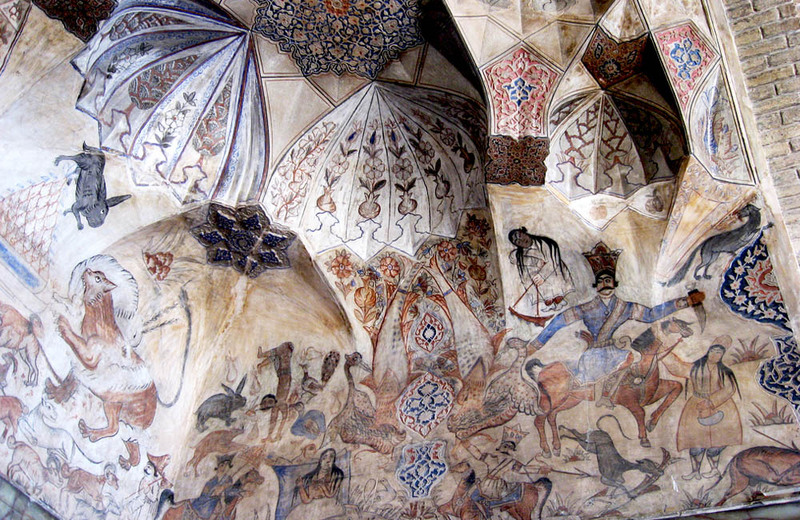 Besides Hammam-e Ganj Ali Khan, tourists can find the Ganj Ali Khan Bazaar, Mosque and Caravanserai, and Mint. All of these buildings are at least four hundred years old and definitely deserve a visit. In these phenomenal buildings, visitors will find exquisite antiquated plasterwork, tile work, wall paintings, calligraphy, brickwork, and beautiful architecture. Address: Ganj Ali Khan Complex, Arg (Tohid) Sq. Operating Hours: 9am. to 6pm.